Falvey Memorial Library :: The Mystery Object in the Corner: What Is It? The Mystery Object in the Corner: What Is It? The table in front of this object, tucked in a corner between the Griffin Room and the entrance to the back stairs, is a popular study spot during the school year. But what is this tall wood and metal object? It seems to have no function in today’s library. Is it a large, free-standing sculpture with its title and artist’s name on the oval metal plate? What we learned about this unwieldy object is that, although now retired, it once played an important functional role in Falvey Memorial Library. 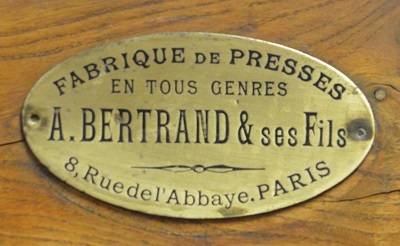 It is an antique standing bookbinding press manufactured in Paris, France, between 1870/71 and 1910 by A. Bertrand & ses Fils (A. Bertrand and Sons), 8, Rue de l’Abbaye, Paris, a company well known for manufacturing printing-related equipment. (“Fabrique de Presses en tous genres” is on the metal label of our press.) This type of press is used “for the final pressing of a book [while glue is drying], as well as during the … cleaning of the spine,” and other parts of the processes of repairing and rebinding. Book presses are still in use and these modern presses are similar to those used beginning in the fifteenth and sixteenth centuries. Falvey’s large book press was probably used in early years in the library bindery. Smaller table top presses replaced this large standing press in Falvey’s bindery at some point. In the past, libraries often housed binderies to repair books and bind journals and magazines into bound volumes. Now such work is generally sent out and in-house library binderies are rare. Falvey had a bindery for many years (starting date is unavailable); most recently the bindery was on the ground floor, and a sign is still on the door, although the space is now an exit hallway. In 1977 the bindery became part of the periodicals department. Still in use in 2000, the bindery’s final supervisor was Laura Hutelmyer, now electronic resources and special acquisitions coordinator in the Collections Directorate. By 2000 very little work was done in Falvey’s bindery; most was sent to a commercial bindery and Falvey’s bindery was phased out. The antique bookbinding press and the sign on the door are the only remnants of what was once an important part of the Library. Thanks to the following contributors: Laura Hutelmyer, Bill Greene (now retired); Rev. Dennis Gallagher, OSA, PhD, University Archivist; Luisa Cywinkski, director of Access Services; Frank Romano of the Museum of Printing; and Richard Minsky.